Scoring high on the AP English Language &amp; Composition Exam is very different from earning straight A&#x2019;s in school. We don&#x2019;t try to teach you everything there is to know about English language&#x2014;only the strategies and information you&#x2019;ll need to get your highest score. In <i>Cracking the AP English Language and Composition Exam</i>, we&#x2019;ll teach you how to<br /><br />&middot;Use our preparation strategies and test-taking techniques to raise your score<br />&middot;Focus only on the rhetorical modes and patterns of exposition that are likely to be covered on the test<br />&middot;Test your knowledge with review questions for each topic covered<br /><br />This book includes 2 full-length practice AP English Language and Composition tests. 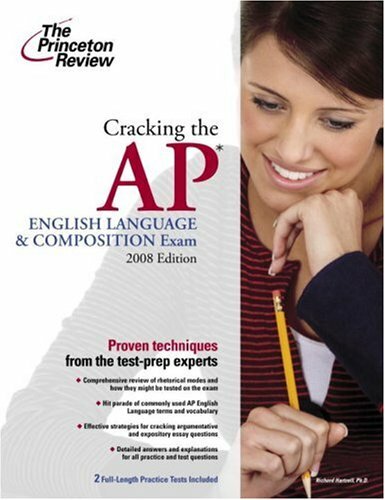 All of our practice questions are just like those you&#x2019;ll see on the actual exam, and we explain how to answer every question.<br /><br /><i>Cracking the AP English Language and Composition Exam</i> has been fully updated for the 2008 test. The experts at <b>The Princeton Review </b>have been helping students, parents, and educators achieve the best results at every stage of the education process since 1981. In addition to helping millions succeed on standardized tests, The Princeton Review provides expert advice and instruction to help parents, teachers, students, and schools navigate the complexities of school admission. Along with classroom courses in over 40 states and 20 countries, The Princeton Review also offers online and school-based courses, one-to-one and small-group tutoring, and online services in both admission counseling and academic homework help.